One of my daughter's favorite movies is The Princess and The Frog. I happen to find it quite enjoyable as well. The music is just so catchy! Well, during one of the many times of us watching it, she finally asked me what the heck are "beignets" ? I haven't ever been to New Orleans...yet. It is on my bucket list of "must-go-to" locations. So, trying to explain a pastry with a puff of air in the middle and then coated with powdered sugar is kind of hard to do for a five-year-old. Especially when I have only heard about how amazing they are. I hadn't ever actually ate one until we made them. How do we solve this problem when we are in Iowa? Far, far away from the French Quarter? Well, we set to work making our own, of course! Tiana from the movie must have amazing beignets, because everyone wants them so badly. I settled on a recipe from someone I know is an amazing baker. After scouring the internet for a suitable recipe to try, her's popped up over-and-over again. I think it is safe to assume that her's are probably the Queen Bee of beignet recipes. You can easily pop over to her recipe here. As I mentioned above, I had never made these before, so I wasn't sure what to expect. I followed her directions exactly, and I came out with a TON of beignets! The box above we delivered to my husband's work while they were still hot so they could enjoy them. We made them during our first big snowfall this year, so it was like delivery a snow pillow...it was a beautiful sight. 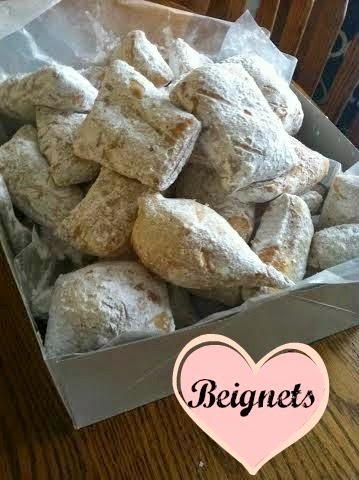 Fresh white snow and these fresh, hot, powdery beignets. Since it was snowing, my daughter bailed on me while I was frying them to play in the snow. I literally stopped frying half-way through the dough so we could deliver this box of wonderful deliciousness before frying the rest for us to enjoy at home. I cut them into about 2 inch squares. I could have made them bigger, but as I said before - I've never made them and since *technically* they were for my daughter, I wanted them small enough for her to be able to eat them without wasting half of it. I probably ended up with 60-75 beignets altogether. I should have kept track. But in the business of frying and then shaking in the powdered sugar, I lost track of everything else for a bit. Mix water, sugar and yeast in a large mixing bowl. Let rest for 10 minutes until bubbly. In another mixing bowl, beat the eggs, salt and evaporated milk together. Add this mixture to the yeast mixture and mix together. Add 3 cups of the flour to the yeast mixture and combine slowly. Add the shortening and continue stirring. Slowly add the remaining flour, stirring constantly. Remove the dough and knead until smooth on a lightly floured counter. Spray a large bowl with nonstick spray and add the dough. Cover with plastic wrap or a clean towel. After it is done rising, heat the oil in a large skillet or fryer. 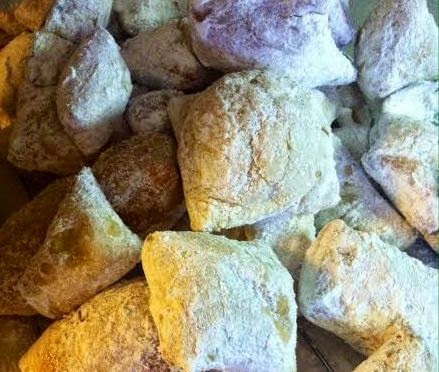 Add powdered sugar to the paper bag(s) and set aside. Turn dough out onto a floured counter and roll into a large rectangle, 1/4 inch thick. Cut into 1-2 inch (or larger, if you prefer) squares. Add a few at a time to the hot oil, flipping constantly (why using a little strainer works well. 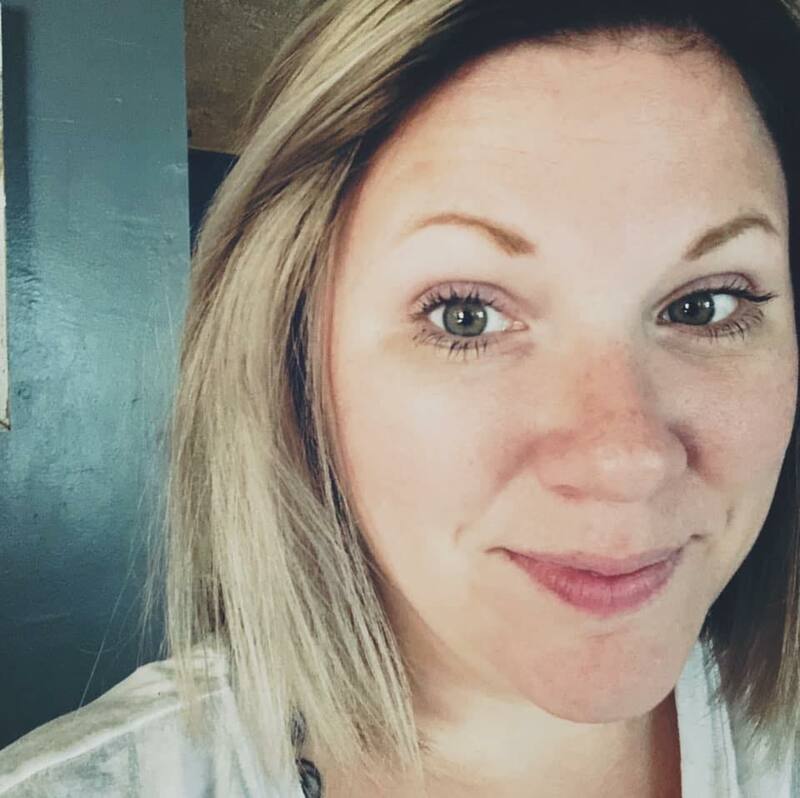 I let them puff up, then flip immediately so one side doesn't brown too much. Remove once both sides are lightly browned, place on wire rack to drain. While still warm, place in the paper bag and shake to cover with the powdered sugar.